The Newbie: You've heard about windsurfing but never thought you'ld be any good; your hand-eye-coordination is renowned as being sketchy at the best and balance is surely a key requirement for staying dry right? 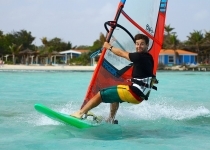 The Wanna-be Newbie: You have actually tried windsurfing once or maybe twice before but won't admit as much as that would put the pressure on you to perform on the water. You would prefer to be classed as a Newbie that picks up the sport at uni very quickly. In a few years time you might finally admit to having tried the sport before university but by then it will be too late as you will be running the windsurf club. The Keen-Bean: Having tried the sport a couple of times you are eager to get on the water at the first opportunity and will be tripping over your uphaul and putting on your wetsuit backwards in your desperate attempts to be first on the water and last off. The Hesitant Improver: You want to improve but you are sensible by nature and cautious that you don't want to pick up bad habits (like putting on wetsuits back-to-front). You listen intently to every word your instructor says possibly making notes in a waterproof notepad. You probably have your own bouyancy-aid and wear gloves to stop blisters on your hands. While safety is certainly important while windsurfing, in order to steepen that learning curve and ensure that you will keep up with the Keen-Beans (who by this stage in the article have already started working on push-loops in their mind...), you need to make sure you get maximum time on the water as there really is NO subsitute. The Carve-Gybe plateau kids: These people can be recognised by their straight line blasting runs across the water followed by a slightly wobbly entry into a downwind carving action which finally ends up with them entering the water at a low speed as they lose all momentum and the will to live. They haven't really improved from this level in the last 20 windsurf sessions and are liable to become disillusioned with windsurfing if they continue to focus only on this maneuver. If you are one of these people then you need to repeat this mantra before you go to bed each night: "there is more to windsurfing than carve gybes, they are transitions between one bit of fun and another, I will move on..". Through regular sessions on the water spent not worrying about the carve gybe you will learn to love the sport again and then one day it you will find you can actually do carve-gybes after all! The "Legends": These guys and girls can be found to belong to one of two distinctiive groups. Group one is generally to be found at the bar accepting drinks from freshers in return for tall stories of their last season in Location X (they can't tell you where it is or they would be forced to bed you..) they often roam in packs and once you've believed their first story of the double-rodeo-onehanded-nofooted-1080 that they made (well almost) last week then they have you in the palm of their hand and you're a lost cause.. The only way to escape is to suggest to one of them that their friend is a better windsurfer and set them off against each other in a tall-story-off. Group two people are the more action, less words kind of people. They will be the water when it's windy and mentally analysing their last session afterwards to work out where they could have gone faster and higher. When asked how good they are, they will often point to a friend and say 'oh you should speak to that dude he's legend on the water', don't let their modesty throw you, they can probably shred! So where do you fit in? Still think you're unique? Sorry to say there are loads of windsurfers out there in exactly the same situation as you so if you want my advice, join a windsurf club, meet your equal number and hit the water. Only then do you have an excuse to talk the talk in the pub! Oh and there was no real reason for the olives image, it just looked kinda cool..